On Oct. 27, 2018, Robert Bowers opened fire during Shabbat services at the Tree of Life synagogue in Pittsburgh's Squirrel Hill neighborhood. He killed 11 people and wounded six others, four of whom were police officers. Those killed ranged in age from 54 to 97. The shooting is being treated as a hate crime, with Bowers facing 30 criminal charges from the state and 29 federal charges. The Pittsburgh community has banded together in the aftermath of the synagogue shooting to heal, to ask questions and to call for change. PublicSource will continue to elevate these topics and conversations as our city comes to terms with this tragic event and looks toward the future. 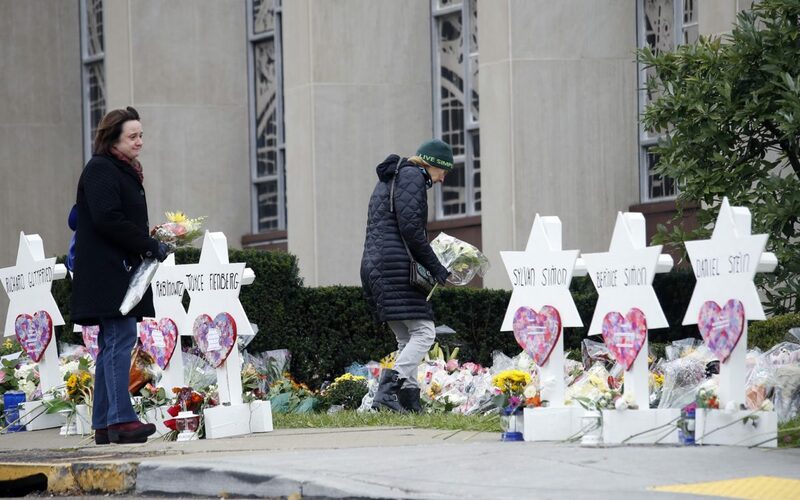 Pushing past cold fingers and the occasional breeze that would flap her sheet music, Monique Mead visited the Tree of Life synagogue in Squirrel Hill to grieve with others. Avi Baran Munro has lived nearly half her life in Squirrel Hill. Along with her husband, Paul, she’s raised four children there, just blocks away from the Tree of Life synagogue. Her parents, Holocaust survivors, followed the family to Pittsburgh to stay close. The Oct. 27 massacre at the synagogue was a blow to the entire family. I answered all of them the same way. Although my wife, Judy, and I live two blocks from Tree of Life synagogue, it is not ours. And, ironically, while the terrifying events unfolded, we were in safe and quiet Israel. told by the people living them. My 5-year-old son was angry and shouting and clingy all last week. Every night from Monday onward, he called me to come into his bed to sleep or asked to come into ours. It’s not his typical behavior. But nothing was typical about last week in Pittsburgh. Saturday, a day when 11 people were shot dead at the Squirrel Hill synagogue, was also Samantha's wedding day. Could my family’s history with anti-Semitic violence explain the intensity of my grief over the Tree of Life attack? I was 23 years old when I learned about my family’s history with anti-Semitic violence. Before last year, I had thought there was no significant family history of experiencing anti-Semitic violence. There is, but no one in my family ever talks about it. The election is Tuesday: Where do candidates on the Allegheny County ballot stand on gun violence after synagogue attack? Following the mass shooting in Squirrel Hill, what legislation do you plan to introduce or support to keep Pennsylvania residents safe from gun violence? I am reeling from the horrifying attack on our Jewish community this past Saturday during Shabbat services at Tree of Life synagogue, home of Tree of Light, New Light and Dor Hadash congregations. The power of one: What if that is all we need to find our common humanity? told by the people living them. I might have been half joking when I told my family I wanted a genetic-spit test instead of a cake to celebrate my 46th birthday. But what better way to face a midlife crisis than to discover new mysteries lurking inside my DNA? Then 11 people died a spitting distance from my living room at the Tree of Life synagogue, and I now believe genetic introspection may be a key for us all, as a society, to come to terms with what we really are. I come from a city on the Mediterranean coast of Turkey, and it was a winding journey that took me to my home now in Squirrel Hill. Thousands of people poured into the streets of Squirrel Hill for a protest to oppose President Donald Trump’s visit to Pittsburgh on Tuesday. Trump came to pay tribute to the slain victims of the Tree of Life synagogue shooting and visit some of the wounded in local hospitals. However, with some people blaming some of the nation’s recent violent acts on Trump’s rhetoric, many in Pittsburgh said Trump is not welcome, including some of the victims’ families. Pittsburgh Mayor Bill Peduto and Allegheny County Executive Rich Fitzgerald reportedly asked Trump to postpone his trip and did not agree to join Trump on his visit. The ‘Safety Through Solidarity’ protest started in Squirrel Hill while the ‘Stand Together in Solidarity’ protest started in Oakland. Chatham University, near Tree of Life, was put on alert Saturday. Administrators are re-evaluating safety policies. Students could hear the unmistakable sound of gunshots. Violence will not stop me. I will wear my necklace with its Jewish star, proudly and unafraid. What happened this weekend is an abomination. A sacred space, a sanctuary, desecrated. To help you process the coverage, events and commentary after the tragedy, we have collected a range of reporting by local and national news outlets. Thousands of people gathered for vigils this weekend to mourn the loss of life in the attack against the Tree of Life synagogue, believed to be the deadliest attack against Jews in U.S. history.